In 1926 Violette Neatley Anderson became the first African American female attorney admitted to practice before the United States Supreme Court. Anderson was born on July 16, 1882 in London, England to Richard and Marie Neatley. The family immigrated to the United States and settled in Chicago, Illinois when Anderson was a young child. She graduated from a Chicago high school in 1899, furthering her education at the Chicago Athenaeum and the Chicago Seminar of Sciences. Violette Neatley married Albert Johnson in 1903; however, the marriage quickly ended in divorce. In December 1906, she married Dr. Daniel H. Anderson, an African American general practitioner, and she took his last name. Anderson served as a courtroom reporter for 15 years before attending Chicago Law School. In 1920, Anderson graduated from the law school and established a private practice after passing the bar and being licensed before the United States Eastern District of Illinois. 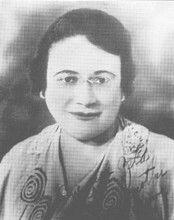 Anderson was one of the first women of any race in the state of Illinois to engage in private law practice. In 1922, Anderson successfully defended a woman accused of murdering her husband; this courtroom success resulted in her being appointed to assistant prosecutor in Chicago. She was both the first African American and the first woman appointed to that post. She was admitted to practice before the US Supreme Court on January 29, 1926. In 1936, Anderson was an active force in lobbying the US Congress for the passage of the Bankhead-Jones Act, which provided sharecroppers and tenant farmers with low-interest loans to buy small farms. The bill, designed to move poor agriculturalists from farm workers to farm owners, was signed into law in 1937 by President Franklin D. Roosevelt. Virginia G. Drachman, Sisters in Law: Women Lawyers in Modern American History (Cambridge: Harvard University Press, 2001); Women’s Law History, Stanford University, http://wlh.law.stanford.edu/biography_search/biopage/?woman_lawyer_id=11329; “Violette Neatley: Trailblazer for Women”, Los Angeles Sentinel, 14 May 2009, http://www.lasentinel.net/index.php?option=com_content&view=article&id=6110:violette-neatley-trailblazer-for-women.